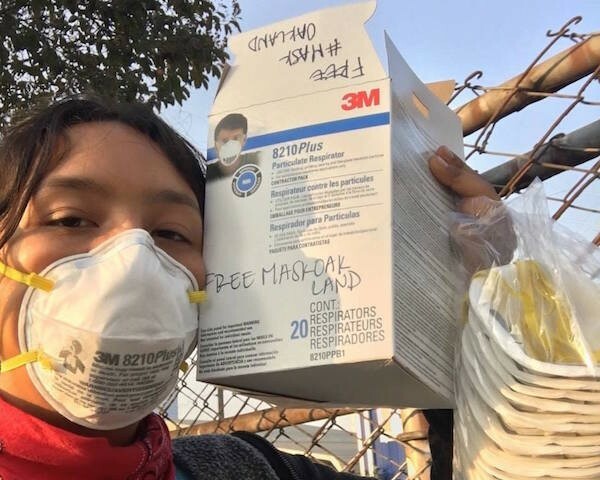 Health officials and activists team up to distribute respirator masks to the unhoused as smoky air shrouds the East Bay. Many East Bay residents can avoid the wildfire smoke that's clouding our region by remaining indoors this week, but some are not so fortunate. Homeless people are at risk of harmful exposure to soot lofted by the Camp fire because they have no place to take shelter. Volunteer activists are responding by distributing face masks to the area’s homeless community. The grassroots group Mask Oakland went out almost immediately after the East Bay’s skies filled with smoke to distribute face masks capable of filtering out some of the most harmful particles from the air. The group is mostly volunteers and the masks were obtained through private donations. Alameda County’s Health Care Services Agency is also contributing to the cause. The agency’s Health Care for the Homeless program purchased about 500 N95 face masks last Friday, David Modersbach of the program’s director wrote in an email. The N95 rating indicates that the masks can filter small particles out of the air, including dangerous smoke particles that can cause inflammation in people’s lungs. On Monday, the county received an additional 5,000 masks from Direct Relief, an organization that assists in disaster response. J. Redwoods, one of Mask Oakland’s organizers, said the overall effort by the county and cities to protect people’s health, especially vulnerable populations like the homeless, is still lacking and more needs to be done. Air in the East Bay has been unhealthy to breath since Thursday, according to the EPA’s Air Quality Index. From Saturday through Tuesday, the conditions worsened. In addition to Mask Oakland, groups like Oakland’s Homeless Advocacy Working Group and the East Oakland Collective have also been distributing masks. The County Health Care for the Homeless program is also handing out masks for individuals and for outreach at their office, 384 14th St., Oakland, open from 9am – 5pm. Mask Oakland is collecting donations and encourages those interested in volunteering to reach out online. Visit Facebook.com/maskoakland for more information and to donate.